This November, Jamie Jones and Kate Simko come together for ‘Opus 1’, a collaboration at London’s arts venue the Barbican for a full concert of original music fusing live orchestra and electronics. This one-off event will witness the duo performing brand new material alongside recomposed originals, alongside a 25-piece expansion of Simko’s London Electronic Orchestra. LEO will be led by violinist Kamila Bydlowska, harpist Valeria Kurbatova, and cellist Davina Shum. Jamie and Kate first joined forces in 2015 with Jamie adding his house sounds to the kaleidoscopic track ‘One Time Game’, featuring Jem Cooke, released on his Emerald City imprint. Next the duo co-produced the track ‘Dark Delirium’ with Katy B, which was an instrumental on Simko’s London Electronic Orchestra album, as well as a track of the same name on Katy B’s subsequent album ‘Honey’. Jamie’s inclusive resonance stems back from his Hot Creations inception, with the label brandishing the flag as possibly one of the most defining labels in its genre. Kate, meanwhile, is no stranger to collaborative projects; she has remixed tracks for the likes of Guy Gerber and Philip Glass, is a film composer, and has had releases on labels including The Vinyl Factory, Ghostly, and Last Night on Earth. 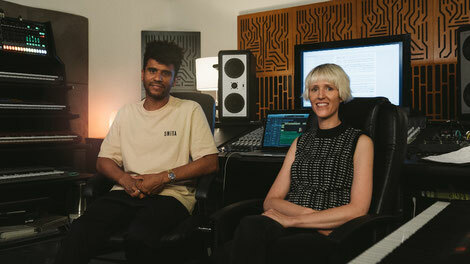 The concert will feature some of Jamie Jones’ tracks recomposed for orchestra, including ‘Hungry For The Power,’ ‘Tonight In Tokyo, and Hot Natured’s ‘Benediction,’ alongside the duo’s aforementioned collaborations with London Electronic Orchestra. Housed in the Barbican, and led by Robert Ames, the principle conductor of London Contemporary Orchestra, Tuesday 27 November is shaping up to be a synthesis of creative forces, cinematic soundscapes and emotive disco strings.